An island nation jetting out of the Pacific, Japan has one of the most established green tea export industries in the world. China is peppered with rolling hills and mountain ranges, India has the Himalayas to the north. The majority of Japan, however, rests at sea level. This means that tea producers have had to rely heavily on refined cultivation and production methods to enhance the production level of their teas. Tea production in Kagoshima is mostly organic, and is the focus of our recent trip to origin. 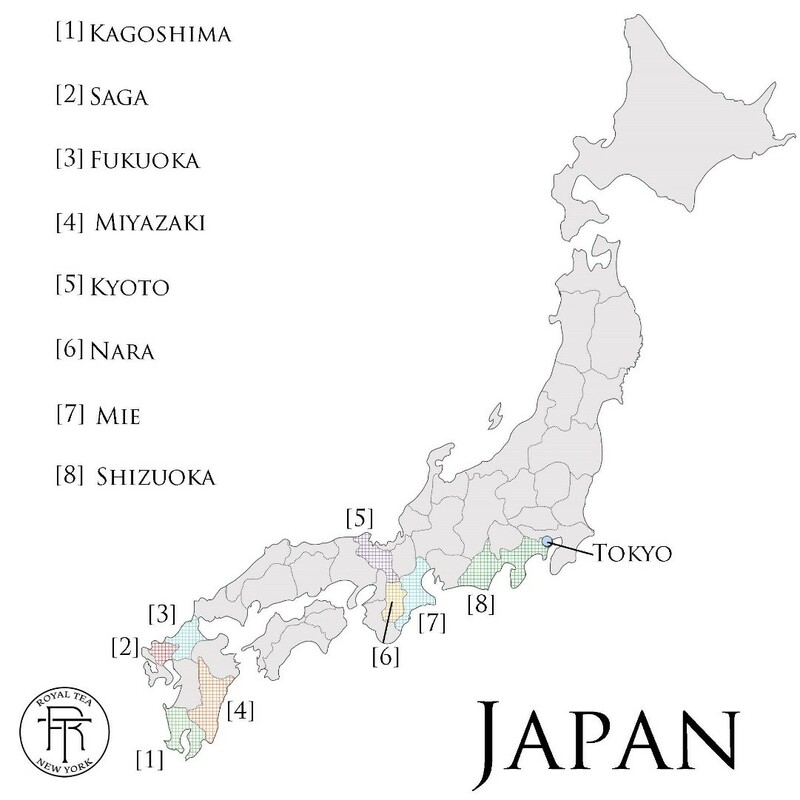 Specific island regions in Japan are known for different types of tea growing. In Honshu, Shizuoka (8) is known for higher end conventional lots. Kyoto (5) in Kansai is famous for matcha. Farmers and processors in Kagoshima (1), located in Kyushu, excel at producing organic teas. The southern-most prefecture in Kyushu, Kagoshima cultivated around 1/3 of Japan’s tea in 2018, roughly 24,000 tons. This well-know tea growing region is also the second largest tea producer in Japan. Officially formed in 1965, Kagoshima’s tea industry specializes in Sencha, Bancha, Kabusecha, Gyokuro, Matcha, Houjicha, and various black teas. The area is also famous for Kamairicha, a rare green tea reminiscent of Chinese lots. Virtually flat, Kagoshima’s topography is inclined at an average of 5%, allowing for mechanized tea harvesting. Kagoshima’s tea harvest schedule consists of three main crop periods. The first flush is in early April and continues for a month through early May. During this time, fresh growth is harvest for tencha, shincha, ichibancha, and kabusecha. The second harvest period begins in early June. During this time, sencha and bancha are produced. Higher end senchas are generally gathered earlier in the season, with the “third tea” boasting lower quality, more affordable lots in early August. The last tea picking season begins in mid-September, during which autumnal bancha is primarily manufactured. 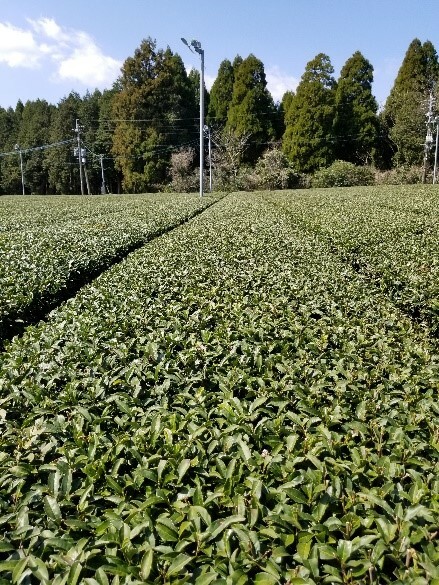 As Kagoshima is known for organic tea production, farmers and processors in the region follow strict Japanese Agricultural Standard (JAS) guidelines for cultivation and handling. This certification is equivalent to USDA or EU standards. Farmers utilize many organic alternatives to pesticides, including natural enemy introduction, rice bran solutions, pheromones, insect trapping and organic compounds. The month prior to first harvest, farmers employ fans and sprinklers to prevent irregular frost damage. Lastly, farmers cultivate a diverse array of cultivars to reduce the risk of disease and pest damage. Genmaicha: A Japanese classic, blending Sencha with lightly toasted rice. The combination of roasted nutty flavors of the rice and buttery notes of the Sencha make this tea a perfect addition to any breakfast menu. Sencha: A perfect everyday green tea. Grown in the southern-most tea producing region of Kagoshima, it’s lightly steamed, which allows the true character of the leaf to shine through. Oceanic in flavor, with notes of butter, steamed greens and pine. Genmaicha with Matcha: Matcha is one of the hottest tea trends in the US. Expanding on that theme, we’ve sourced an organic Genmaicha blended with organic Matcha, combining two of the most popular styles of Japanese green tea. Buttery and toasty combine with sweet astringency to make this a great addition for anyone looking to add something unique to their tea offering.